NB: I reworked this piece and eventually published an updated version with LARB. You can see that (much better) version here. This piece is something I was writing on spec for the LA Review of Books until the editor dropped out of contact. I had harbored ideas about finishing it and publishing elsewhere, but I never really got around to that, and since _The Ringer _is now launching in Grantland’s stead (complete with its own Game of Thrones discussion show on HBO), Game of Thrones is back, and the NBA playoffs are happening, it seemed like a good time to put it up here. I doubt I watched more than five full games over the course of the last NBA season, yet, without researching, I can tell you that there is a section in the league’s collective bargaining agreement allowing something called a mid-level exemption, giving teams a chance to sign players for a smaller hit to the salary cap; that the salary cap will jump in a few years due to a new TV deal; and that the expected jump is the reason LeBron James continues to sign short deals with the Cleveland Cavaliers. I also know that, in an attempt to maintain competitive parity between small and large markets, teams can re-sign their own players to longer deals worth more money than other teams can, and, though I can’t say I really understand them, I can follow along in discussions about bird rights, revenue sharing arrangements, and sign-and-trades due to cap holds. I’m in the opposite situation when it comes to Game of Thrones. I watch every episode as it airs and spend more time than I’d like to admit browsing wikis to brush up on Westerosi lore, yet, somehow, my sister is always able to outflank me in discussions about the show. The knowledge gap between us doesn’t stem from anything George R. R. Martin has created, but from her rabid consumption of Hollywood news, behind-the-scenes footage, and cast interviews. This dynamic is telling of the way that the production of various forms of entertainment, including both sports and television, is increasingly a part of the entertainment itself. That is to say, part of what entertains us–part of what we choose to be entertained by–is the political economy of entertainment. As a result, the relation between entertainment and reality is shifting, and the kinds of things we consider as goods available for consumption as entertainment are expanding to include more of the interactions, emotions, and relationships that act as conditions of possibility for entertainment in the more traditional sense. According to Sharpe, the causes behind the NBA’s recent popularity growth include everything except the actual basketball being played, the raison d’etre of the whole league. Importantly, Sharpe points out that its journalism–online, citizen, and traditional–that’s necessary for the change. Another Grantland writer, Zach Lowe, as well as Yahoo’s Adrian Wojnarowski and ESPN’s Brian Windhorst, have led the way. Their focus is on the (previously) behind-the-scenes wonkery general managers and front offices fret about as they build the teams we watch fight for championships. Of the three, only Lowe carries a reputation for bringing the same focus to basketball strategy; Wojnarowski and Windworst have become leading commentators and journalists of the sport solely due to their understanding how teams make and spend their profits. The upshot is that negotiations behind trades, contracts, and revenue agreements are no longer ancillary to basketball fandom–in fact, they’re almost essential. Not only are they enough for journalists to make careers on, but they’re increasingly the focus of popular interest. Consider, for instance, Football Manager, a computer game where players control a soccer franchise. The gameplay includes negotiating trades, scouting prospects, and managing budgets, but not passing, shooting, or running. It’s more spreadsheets than fields, and it’s excruciatingly detailed–enough so that the database behind it is actually used by real-life soccer teams as part of their scouting operations. Yet it’s far from a niche interest. Two documentaries have been released in the past five years examining its popularity. Moneyball, a book and subsequent Brad Pitt movie about the way the Oakland A’s baseball club put together a championship team without the massive salaries of their competitors, offers another example. These off-the-court details are both entertaining in their own right, and used as an element in the entertainment of the sport itself. To see the first, consider the DeAndre Jordan transfer saga from this past summer. Jordan was a free agent who made a verbal agreement to sign for the Dallas Mavericks before reneging and re-signing with his previous team, the Los Angeles Clippers. Jordan’s (in)decision sparked a social media frenzy that the Wall Street Journal referred to as an “NBA emoji war,” the details of which are too absurd to cover in detail here. The events were widely reported and included rumors that Clippers players barricaded themselves in Jordan’s house to keep Jordan away from Mavericks owner Mark Cuban (egged on by Blake Griffin tweeting a photo of a chair wedging a door closed). But in addition to providing a week’s worth of articles for sports journalists, the events will no doubt be referenced throughout the season, whenever commentators want to question Jordan’s “maturity” or the potential rivalry between the Clippers and the Mavericks. 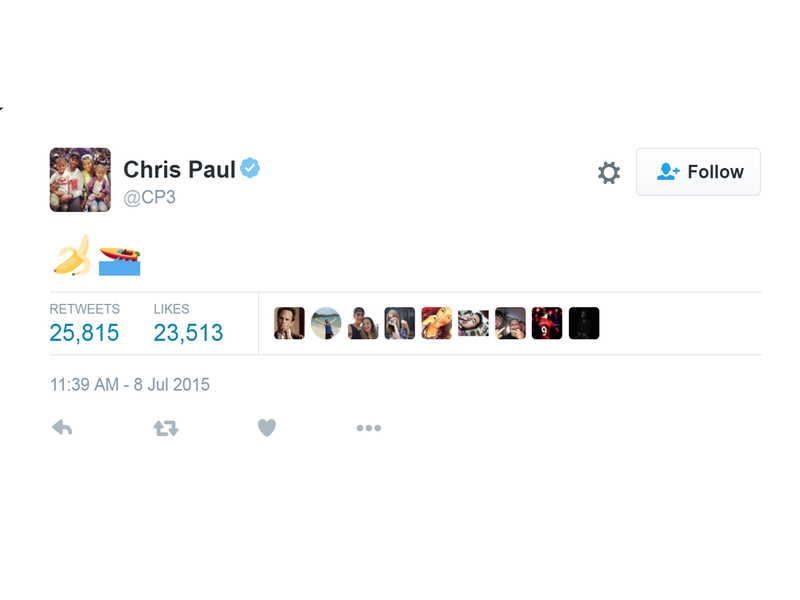 Not knowing that Chris Paul tweeted a banana and a boat emoji over the summer doesn’t just mean you’ve missed a funny story; it also detracts from your ability to follow the on-court narratives during the season. One simply cannot be an informed NBA fan without knowing Jordan’s saga. The same goes for following LeBron James’s redemption story in Cleveland, following the PR blunder of “The Decision” in 2010, or the fact that the Oklahoma City Thunder may have wasted a chance for NBA glory when they refused to pay a salary cap penalty to keep James Harden. These issues have always existed in sports to some extent. Because narrative arcs are always impositions onto the competition itself, rather something inherent in it, outside information has long been brought in to create heightened tension, especially since the growth of mass media. The way this happens is changing though. The assumed knowledge about the private lives of athletes is greater. Michael Jordan’s persona had as much to do with Nike’s marketing department as it did his feats on a court, but he never faced the scrutiny LeBron has for sad Instagram selfies after a tough loss, nor the analysis of locker room dance parties. The blending of private lives with on-court performance is not limited to social media, that oft-cited deus ex machina for what’s changed in the modern world. The Players’ Tribune, a website where professional athletes (or, more likely, their ghost writers) pen articles about recent events, is perhaps the best example. Less than a week after DeAndre Jordan’s emoji war, both Jordan and Blake Griffin explained the event at the website. Even Larry Sanders, a much maligned quasi-star who quit the NBA due to anxiety and depression, told his story on the website. Even if these articles are PR stunts under another name, they become assumed knowledge any NBA fan is expected to have. Because basketball and other sports now include the private lives athletes, as well as the ways those athletes are paid, as part of their televised product, non-sports factors are increasingly central to sports. On message boards for the soccer team I root for, Tottenham Hotspur, fans argue that Deandre Yedlin, an American star who joined the team last year, was a great signing because he increases the American fanbase, thus expanding revenue streams while the team works to construct a new stadium. It’s hard to imagine soccer fandom having less to do with soccer. The analogous issue in television helps display the problem raised by this shift in entertainment. In the background of all television criticism now is the much-heralded downfall of traditional TV brought about by streaming options, and its effect is felt in how we watch. When Arrested Development debuted on Netflix in 2013, many reviews were made explicitly through the lens of the new fact that we could watch an entire season. Though we’ve become more at ease with binge watching as a fact of television, reviews still often come for seasons at a time, not episodes. This fact may help explain why Game of Thrones—a show still operating on the traditional model—offers minidocumentary commentary immediately after each episode. It also helps explain how Grantland can produce a recap, a dedicated podcast, discussions on an additional podcast, and a precap each week between episodes, during which the topics include not only plot points, but also actor and producer comments and changes from the book. Like with the NBA, a single television show can become a year-round phenomena. To exist on the traditional model today, it might very well have to become a year-round phenomena. Thus, while stardom has always been an essential part of television, and the contracts stars can demand have long been news–just think of the furor over the payday the Friends cast received–stardom is now wrapped directly into the consumption of the show itself. Consider Jon Snow: immediately after the season five finale of Game of Thrones, Snow actor Kit Harrington and showrunners David Benioff and D. B. Weiss gave numerous interviews assuring the audience that Snow really was dead and that Harrington would not be returning next season. Reviews turned away from what happened on screen to predict upcoming Game of Thrones plot points, ignoring what they could learn from Westeros for what they could learn from the set. For evidence of their theories, critics pointed to the contract Harrington signed, or the length of his hair, or whether or not he was seen near the show’s filming locations, not anything learned by actually watching the show. It now seems widely accepted, despite what Harrington, Benioff, and Weiss stated in their interviews, that Jon Snow is not dead, and Harrington will indeed return to the show. Whether or not that turns out to be true, interviews–supposedly meta-television existing outside the framework of the show itself–are being used to affect the audience’s perceptions. Other directors and producers have tried this tactic as well, especially with super hero films, where much about the plot is already known. In effect, they are using what are ostensibly promotional materials as misdirection about the plot. The line between the products and the production of those products is evaporating. Because the blending of entertainment with the production of entertainment had led to meta-television like The Comedians and the success of HBO’s 24/7 documentary series following NHL teams, and because the private lives of actors and athletes are put increasingly assumed to be part of the product they help create, reality television is the obvious point of the comparison for entertainment writ large. In reality television, executives take the real emotions and life developments of their subjects and consciously script them into entertainment–a process that strips away much the reality supposedly captured. The very fact of writers and producers crafting the portrayal of marriages, children, lost friendships, and other developments on The Real Housewives and Keeping Up With the Kardashians ensures a distance between viewers and their subjects, most especially because the subjects have consciously agreed to publish their lives. It’s no secret that to be cast on a reality show, you must play up your personality to ensure the drama and interest viewers crave. In that sense, reality television is the intentional crafting of a public persona for the very purposes of entertainment. While actors’ and athletes’ self-promotion through interviews, social media, and the Players’ Tribune follow that trend, it’s at the service of the sport and show in question. For the moment, then, the fictionalization of real events in these cases is still solely reactive, still fictional in the way everyone’s social media accounts or memoirs are fictional. DeAndre Jordan can use the new interest in the NBA offseason to craft a response that paints himself in a better light, but the media focus that brought his story into the public was still largely out of his control. It’s for that reason that the narratives forced upon television and sports retain a sense of genuine tragedy that the producers attempt, and fail, to bury. Think of Charlie Sheen’s departure from Two and a Half Men or the fact that Atlanta Hawks player Thabo Sefolosha missed the playoffs because his leg was broken by a police officer ten days before they started. Worse still, and showing how the turn to the production of television affects even reality television, was the media coverage about what would happen to 19 Kids and Counting in light of Josh Duggar’s molestation allegations. But how long until the real-life elements from the production of entertainment that we are now following follows the trend of reality TV, losing its reality in the process. The space stars have for their private lives is being reduced even further. It’s not just the threat of tabloid photographers at every turn, but conditions placed upon them by their industry, capturing additional labor outside of acting or competing. How long until directors request certain travel arrangements for their stars to avoid having them seen on set too early and running a twist ending? Will it seem over the top if a produced requires a star to conduct interviews in a certain way in order to further the effect of a film? (In this sense, Joaquin Phoenix’s I’m Still Here seems like less a mockery of the industry and more a portent.) Will athletes be hired for their marketability? The Players’ Tribune is novel now, but for how long? These questions affect more than just the working conditions of the rich and famous. Viewers face a question about how they are willing to consume entertainment. Each of these additional elements of fandom in sports and television requires additional time spent following the items in question. Reality television has proven itself to be distinctly unreal, and in the desire for “authentic” experience, we have begun consuming real life as a part of the entertainment. On the one hand, such a shift raises a question about how long this set-up can last. Once the entertainment industries attempt to completely capture our interests for reasons of profit or art, what happens to the reality that’s currently drawing our attention? And where will we turn next? On the other hand, as the entertainment industries begin to expect that fans can continuously follow interviews, social media posts, articles, documentaries, podcasts, and more, what happens to the time spent outside of entertainment? At what point does it stop being entertaining?